Practical advice: the best we can do is slow down the bad guys from getting into our websites. Forcing users to log off and checking referrer headers help. The only complete solution is to include an authentication token in the body of EVERY request. Samy hacked MySpace profile to add friends and update profile with worm. 1 million users infected in one day. 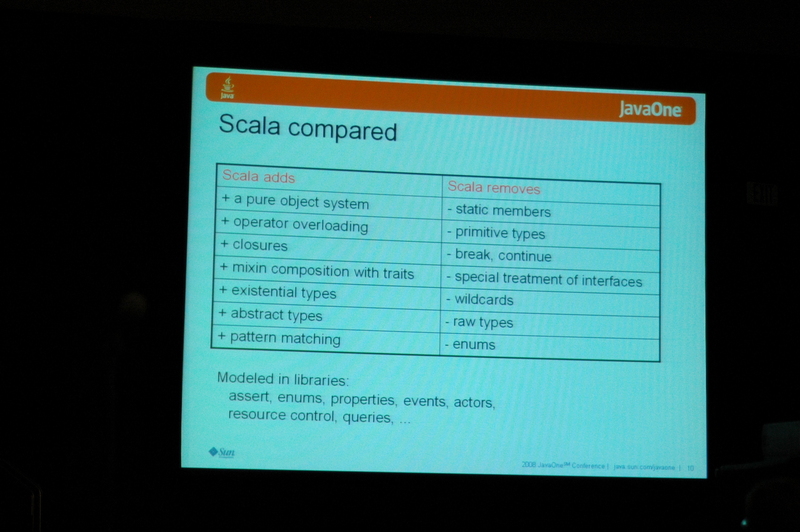 Scala is the Java programming language of the future. 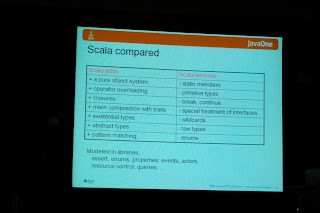 It's interoperable with Java environment, and "is just another Java library". What is it? It's a scripting language, a composition language, an object-oriented language, a functional language. What amazed me is the ability to implement new control structures. Now that's a "dynamic" language. New puzzle for each day they were at the JavaOne Pavilion. Since I'm bringing these home, here are some hints. Puzzle #2: "x % y" What happens when y is a negative number? Puzzle #3: Bits '&' binary.